With that, I decided to have a linky party where mommy blogger around the globe could link up any posts that they can consider as little luxuries. It could be crafts, recipes, tips and others that would speak about our little ones. But before we start the linky party, it wouldn't be complete if I will not show you this week's Little Luxuries: Toy Storage Bench. 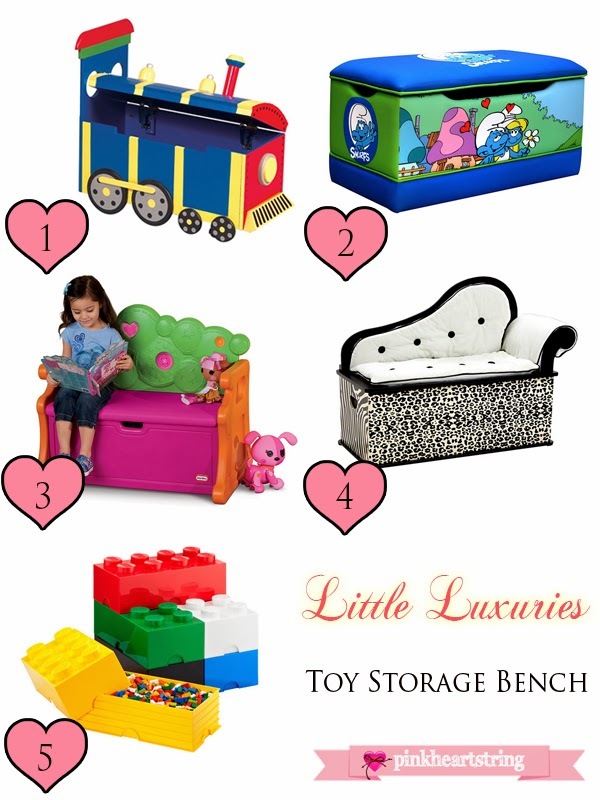 And oh, don't forget to leave your comments and tell us which Toy Storage Bench is your favorite! Could you guess which one is my daughter's choice? The Lalaloopsy bench storage of course! You know how she loves Lalas so much! What is your kiddo's pick? My daughter would just love the Wild Side Bench Seat,. She is really in to zebra right now! A great link up. Thanks. I needed to add to my list of blogs to follow. Those are super cute toy boxes. Well they could be anything. Even a pirates chest of treasures. I LOVE the Wild Side one. It's perfect for any little diva! I wish they made one big enough for me! Love the train one! My boys would have really enjoyed this when they were younger! Love the lego storage bench! So fun.